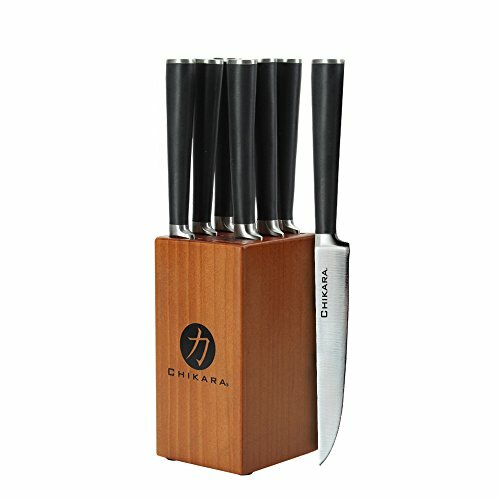 Ginsu Gourmet Chikara Series Forged 9-Piece Steak Knives Set – Steak Knife Set in a Finished Hardwood Block, 07134DS by Ginsu at Sara Stage. MPN: 07134DS. Hurry! Limited time offer. Offer valid only while supplies last. Chikara Series blades are made from Japanese steel that is known for stain and rust resistance, strength and its ability to hold a sharp edge. These Ginsu Chikara forged steak knives are one solid piece of premium Japanese Stainless Steel from tip to tang so you can approach every recipe with the confidence that your knives will do whatever you ask. These Ginsu Chikara forged steak knives are expertly balanced to give you the perfect blend of power and control you need to cook through even the trickiest recipe safely and comfortably. This Ginsu Chikara forged steak set includes Eight forged 4.5-Inch Steak Knives in a Toffee Block.